Much of the weather experienced on land has its origins over the oceans. Weather is the state of the atmosphere at any given time and place. Earth's oceans and atmosphere are in constant contact, sharing water, gases, and energy. The conditions of one directly affect the conditions of another. Unfortunately for weather predictors, these complex interactions behave according to chaos theory. That is, the outcome of any equation that attempts to describe them is so sensitive to tiny differences in starting conditions that the results appear to be random, or at least very difficult to predict. Uneven heating of Earth creates circulation cells in the atmosphere. Circulation cells exist over each hemisphere, north and south. They are responsible for two-thirds of the heat transfer from tropical to polar regions. As air heats over the equator, it rises and cools. Water vapor condenses and falls as rain in the equatorial zone, drying the air mass as it migrates north or south from the equator, cooling and becoming denser than the air around it. The air mass begins to drop near the subtropical regions at about 30 degrees latitude and is drawn south by the rising tropical air. Two circulation cells are created north and south of the equator, termed Hadley cells. Between 30 degrees and 60 degrees latitude north and south are the Ferrell cells, which are formed in much the same way except that they rotate the opposite way, north to south. Over the poles, from 60 degrees to 90 degrees latitude, lie the polar cells, again circulating opposite from the Ferrell cells, south to north. * The jet streams are zones of fastmoving west-to-east winds in the upper atmosphere between the Ferrell and Polar cells. Regions of rising air exhibit low pressure and wet weather, whereas areas of downward movement are often dry with high pressure and clear skies. The Coriolis effect is caused by movement of air over a rotating Earth. As a result, air masses appear to curve clockwise in the Northern Hemisphere and counterclockwise in the Southern Hemisphere, creating wind belts that drive the atmosphere around the Earth. In the Hadley cells, winds travel to the west, bending to the right in the north and left in the south. In the Ferrell cells, winds reverse and flow west to east, again bending to the right in the north and left in the south. The polar cell reverses again and flows east to west, also being influenced by the Coriolis effect. These moving air masses are responsible for the creation and distribution of weather systems throughout the world. Wherever the Sun is perpendicular to Earth's surface, the most heat absorption takes place. Equatorial and tropical regions have a net gain of heat, whereas polar regions experience a net loss. Both air and water currents redistribute heat over Earth. The Sun warms the surface of the ocean and land, which in turn warm the atmosphere from the bottom up. Wherever the atmosphere contacts warm water, evaporation occurs and water vapor and energy are transferred to the air mass. As the moisture-laden air mass rises to high altitudes or passes over a high landmass, it cools and the water vapor condenses and falls as precipitation. Because weather experts were able to track Hurricane Hugo in 1989 with satellite images before it struck Charleston, South Carolina, many lives were saved in an early evacuation. 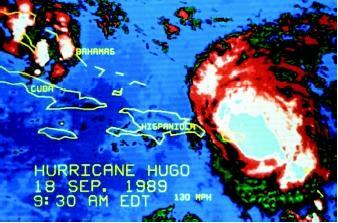 Three days before crashing into the eastern seaboard of the United States, Hugo churned winds of 325 kilometers per hour (130 miles per hour) over the Caribbean. The direction of air movements and the temperature of the ocean water determine the direction storm fronts take as well as their intensity. A tropical cyclone, variably known as a hurricane, typhoon, or cyclone, is a huge rotating air mass, typically having very low pressure, high winds, and torrential rains. Tropical cyclones are the largest storm systems on Earth. Air always moves from areas of high pressure towards areas of low pressure. The speed of the airflow increases as the pressure difference between the two air cells increases and their proximity decreases. Hurricanes begin as low-pressure cells that break off from the equatorial low-pressure belt. They begin to spin due to the Coriolis effect and pick up large amounts of water vapor and heat energy as they pass over the warm tropical water. When wind velocity within the storms reaches 120 kilometers (77 miles) per hour, tropical storms are upgraded to hurricane status. In large hurricanes, wind speeds have reached 400 kilometers (250 miles) per hour. Hurricanes form only in the late summer and fall, when water temperatures reach at least 26 degrees Celsius (79 degrees Fahrenheit). They travel with the trade winds flowing east to west. Most hurricanes last 5 to 10 days and remain in the tropical region. Some storms, however, pass into the middle latitudes where they can cause great destruction along the east and west coasts of the Americas. Changes in the ocean temperature can affect weather patterns around the world. One of these cyclic changes is the El Niño/La Niña effect. El Niños occur when there is an abnormal warming of the ocean waters in the middle and eastern equatorial Pacific and Atlantic Oceans. 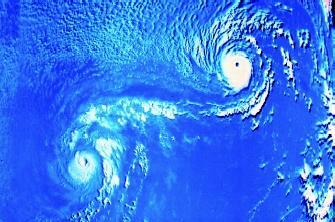 Two cyclones rotate about a point between them, illustrating the Fujiwhara effect. The two storms commonly move off together while still locked in this rotation. During normal years, consistent trade winds blow east to west across the ocean surface along the tropical region. If the trade winds along the equator slow or cease, the warm water is allowed to flow back to the middle and eastern Pacific. This layer of warm, nutrient-poor water prevents cold-water upwelling in the eastern Pacific. Without this source of the nutrients, which nourish the algal base of the food chain, the effect on ocean biology is significant. The areas of tropical storm generation are also shifted to the east. The track of the jet stream and approaching storm systems moves south from the wet Pacific Northwest to the dry areas of the Southwest, causing drought in the northern United States and floods in the south. As trade winds increase, the warm water is pushed back to the west, allowing cold nutrient-rich ocean water to rise from below. This is an example of the La Niña effect, which defines a cooling of ocean surface waters. It generally signals decreased storm activity for the lower latitudes and increased storm activity in the higher latitudes. SEE ALSO Climate and the Ocean ; El NiÑo and La NiÑa; Ocean Currents . Aherns, C. Donald. Essentials of Meteorology, An Invitation To the Atmosphere. Minneapolis/St. Paul, MN: West Publishing Company, 1993. Garrison, Tom. Oceanography, An Invitation to Marine Science. New York: Wadsworth Publishing Company, 1996. Summerhayes, C. P., and S. A. Thorpe. Oceanography, An Illustrated Guide. New York: John Wiley & Sons, 1996. Thurman, Harold V., and Alan P. Trujillo. Essentials of Oceanography. Upper Saddle River, NJ: Prentice Hall, 1999. National Climate Data Center. National Oceanic and Atmospheric Administration. <http://lwf.ncdc.noaa.gov/oa/ncdc.html> . * See "Climate and the Ocean" for a diagram showing these circulation cells.